Over many years, the Mowat Centre’s research has documented the fact that Ontarians receive far less in federal spending than they send to the federal government in tax revenue. Newly released data again highlights this “fiscal gap” – and shows that it is growing. While some degree of redistribution away from Ontario is justifiable if done in a principled manner, a considerable proportion of this gap stems from unprincipled allocations of federal funding. Ontarians have paid between $6.5 billion and $13.0 billion more annually towards federal revenues than they have received in federal program spending. In 2016 alone, this fiscal gap was $12.9 billion. Alberta, British Columbia and Saskatchewan were also net contributors to the federation between 2007 and 2016. Alberta was the largest net contributor over that period, with a cumulative net contribution of $228.6 billion. On the other end of the spectrum, Quebec, Manitoba, the Atlantic Provinces and the territories were consistent net beneficiaries. Saskatchewan changed from net beneficiary to net contributor status in 2009. There is significant room to increase federal transfers’ fairness for Ontarians by allocating unprincipled transfers in a principled manner. Individual federal transfers have different policy objectives. A fair allocation requires that a transfer employ an allocation principle appropriate to its policy objective. While some transfers in Canada operate in such a principled manner, others do not. 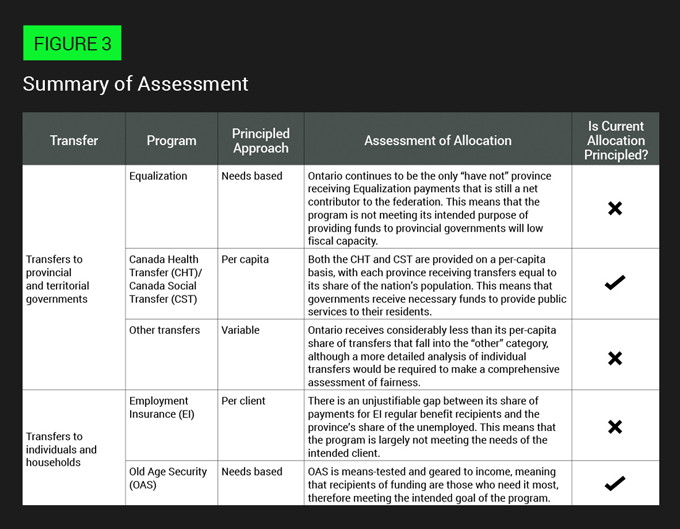 Unprincipled allocations make up a significant proportion of Ontario’s fiscal gap. Equalization, “other transfers” and Employment Insurance (EI) are prime candidates for principled reforms that would result in increased fairness for Ontarians and a reduced fiscal gap while also better serving the policy objectives of those transfers.